LA SCUOLA È APERTA PER LEZIONI ! Classes are now scheduled for March 2019 ! and/or for anyone wishing to pursue this lovely language! 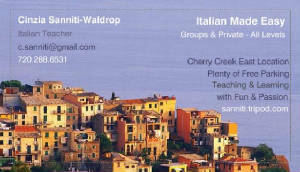 Note: You will find links to a translation engine and a Italian<>English dictionary on the "Meet the Teacher" page. Week 1: Pronunciation. Useful questions and answers. Numbers. I would like (=Vorrei). Week 2: Review of 1st week. New vocabulary. Singular and plurals. Week 3: Learning the article: a + vocabulary word + adjective. Describing pictures, people and things. Week 4: Telling time, days of the week, months of the year. What's the weather like? Recognizing adverbs and learning how to conjugate verbs. Week 5: Food items and role-play ordering from a menu. Italiano I-b (Libro I) A good review of all the above, plus practice with verb conjugations and the adverbs [abbastanza, meglio, presto, spesso, ecc...]. Italiano I-c (Libro I) We will do the idioms using "to have" [i.e., avere fame, sete, ecc...], many useful expressions, and an introduction to the irregular verbs [andare, venire, fare, dare, dire...], delve into some role-play, ask and answer questions while working on some of the most useful verbs. Italiano II (Libro II-p.1) know all of the above, and now are being introduced to: piacere; potere, dovere, and volere. Getting more comfortable with the language, more vocabolario, espressioni, dialogo and practice with verbs. They have been introduced to the past with the helping verb "avere" but have yet to study the helping verb "essere" with the past tense. Italian II-b (Libro II-p.15) all of the above, plus learning more challenging vocabulary and additional grammar. Sentence structure being practiced again and again to generate confidence in their ability to understand and converse. They have done the 7 ways to say "the", items of clothing, and the "passato prossimo" with "avere" and are slowly getting comfortable with "essere" as a helping verb in the past tense. Italian III all of the above, plus have had more practice with "essere" verbs; are familiar with the difference between the two Italian verbs used to translate <to know> and the difference between <tempo> and <volta>. They have been introduced to the "da or duration form" (abito a Denver da 23 anni), the gerundio (sto mangiando). They need more practice with the articulated prepositions (nella, dei, sul, ecc. ), the possessives (il mio, i miei, la tua, ecc.) and need to start using the imperfect (mangiavo, parlavo, ecc.). Italiano III-b all of the above plus they are much more comfortable using the past tense (passato prossimo) of verbs using both avere and essere as the helping verb: ho mangiato, ho comprato, sono andata, sei stata, ecc... Have done role-play with clothes and shopping. They have been using the possessive and the articulated preposizioni [al, della, agli, sullo,...], the present and past gerundio [sto mangiando, stavo dormendo,...] and are slowly starting to acquire a taste for the imperfetto [mangiavo, lavoravo, ecc...]. They have been introduced to reflexive verbs and have had practice with the ordinal numbers and the command form. Italian IV-b all of the above, plus reciprocal verbs, body parts, and all the direct & indirect object pronouns. Have started to comfortably use the futuro, the conditional, the imperativo, and the subjunctive. They love speaking in italiano without any prompting on my part! • Cinzia was fun, wonderful, spirited. Made me want to learn. • Great technique – easy to follow. Very effective. • Liked interaction--Very encouraging. Made it interesting. Every class went by too fast! • More than just language skills, lots of culture. High class participation. • Teacher is patient and thorough. Liked its spirit--lots of fun! • Combined good teaching skills, a very supportive attitude, a safe atmosphere, encouragement no matter our skill levels and it seemed everyone learned a lot and enjoyed it. • She made learning fun--great knowledge & wonderful attitude. • Energetic, enthusiastic – really keeps the class moving and making everyone talk. • Learned a great deal of Italian, more than I expected. • I am excited to go to Italy soon. I feel very well prepared. • She is intelligent, personable, entertaining and well organized. • Cinzia is a wonderful teacher! I learned a lot more than I thought I would in 5 classes. • Recognized that adult learning is difficult ~ made the class fun. • Excellent – Very imaginative & engaging. • Cinzia had a very good method of teaching the language in an appropriate progression for beginners. • She is enthusiastic and well prepared. She made the experience fun as well as educational. • Helpful and very attentive. Very personable and welcomed questions and encouraged learning. • Gave us very practical information. Made the class fun. • Cinzia is a born teacher. She made the learning of Italiano fun. It was like a party. • Cynthia's real life experiences added immensely to the course. Would you recommend the class to a friend? YES! Click on the box above "Italian For Travelers - Italiano per chi viaggia: short tests for practice..." or the Fodor link below to see how much you know regarding travel vocabolario in italiano. I've moved the map of Italy, the train & car rental info to the Travel Links page! 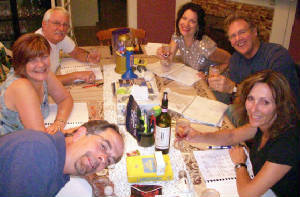 Fodor's Language Site useful expressions, dining out, airport, hotel, taxi, sightseeing, shopping...! The easiest way to learn a language is by interacting with others. Learning the basics is all well and good but actually using the language is the only thing to get the brain to acquire the language. Remember you will start understanding the language before you are comfortable speaking in the new language. If you want to speak Italian you have to use it! If you have no one to interact with in Italian outside of class, please write to me using any Italian you know. Let me know if you would like me to correct spelling and grammar mistakes OR if you just want to practice communicating in your new language!